trash: Place 1 advancement token on a card in this server. "Once every week, we perform a drill. Except, I'm the only one who knows it's a drill." If the Corp moves Calibration Testing to HQ, can they use it to place advancement tokens on an agenda in HQ? No. Only installed cards can host advancement tokens. Calibration Testing is SanSan City Grid done right. It's suitably costed, both to rez and trash, unlike SanSan's ungodly 5 credit trash cost, and being single use means that you can't just windmill agendas like you could with SanSan. 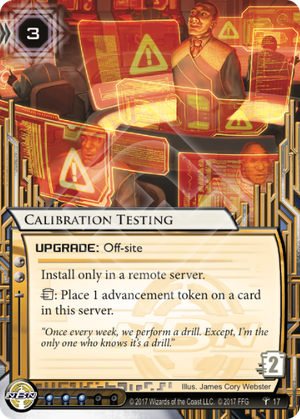 Regardless, this is genuinely strong, and expect that most NBN decks, be it CTM, Sol, or NEH, will run 3x of these bad boys to score out effectively vs a runner that fails to trash these. Whether thrown out in the open among PAD Campaigns, or behind a couple of nasty taxing ice, the runner has to respect the threat this card poses... especially since they can be stacked to score bigger agendas, or score out from under the nose of a Shaper who's a little too pushy with when they are willing to grab Clot. Between Sansan, Breaking News and Astro it is becoming more clear as time goes on why so many people still hate yellow to this day. I see this card as a great compromise and a perfect way to herald a new age for FA in NBN. May it never be as disgusting as before.